There were no tickets sold with all six numbers in the latest drawing of the multi-state Powerball lottery and the estimated jackpot for Saturday’s drawing is expected to grow to $224 million. One ticket each with five numbers, but missing the Powerball number, was sold at a San Jose convenience store and in North Carolina. The one sold in San Jose is worth $658,346 and the one sold in North Carolina is worth $2 million, the Multi-State Lottery Association, which conducts the game, announced. 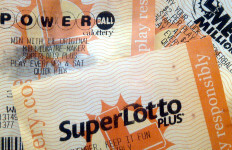 The player in North Carolina who purchased the ticket with five numbers, but missing the Powerball number, utilized the Power Play option, where for an additional $1 per play, non-jackpot prize amounts are multiplied by 2, 3, 4, 5 or 10 times and a ticket with five numbers, but missing the Powerball number, is worth $2 million, according to the Multi-State Lottery Association. The numbers drawn Wednesday were 5, 13, 28, 38, 63 and the Powerball number was 21. The jackpot was $206.3 million. The drawing was the 12th since a ticket with all six numbers was sold. The odds of matching all five numbers and the Powerball number is 1 in about 293 million, according to the Multi-State Lottery Association. The overall chance of winning a prize is 1 in 24.87.